What is Clifford Burr Bridal’s opening hours? The boutique is closed on a Sunday. Our gowns are all sold at our designers’ Recommended Retail Price (RRP) – but in the unlikely event that you find any dress that we stock sold locally for less then we will be happy to match the price as long as you can provide us with proof of the other price (excluding off the peg prices). What happens if I need alterations on my dress? 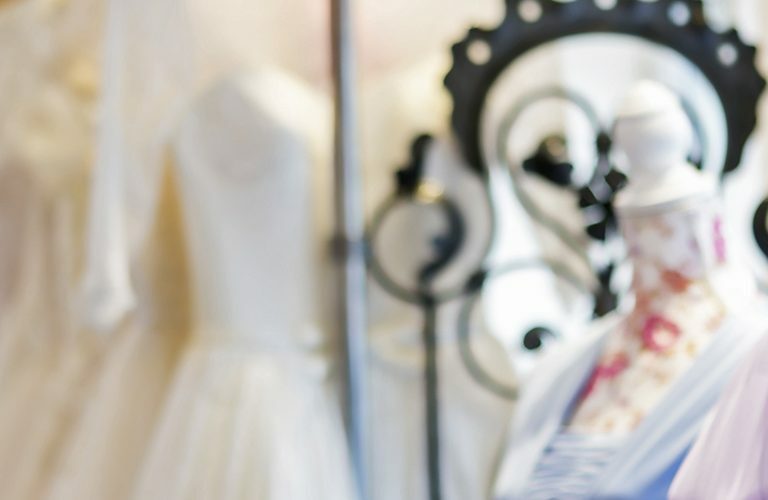 All of the seamstresses that work alongside Clifford Burr Bridal are independent. However they have been working with our brides for years and are fantastic at what they do. Fittings can be arranged to happen in store; with ourselves helping you plan your initial consultation with them. If you have purchased an ex sample gown then alterations must be arranged between yourself and the seamstress whose number we have provided. After this all appointments will be booked directly between you and the seamstress who is working on your gown. As the dresses are being made especially for each bride we are unable to cancel any orders. Therefore the balance of your dress will still remain outstanding and will be due when the dress arrives. You can choose your accessories at any time although we do recommend doing so when you either order your gown or when you come in to try your gown on. That way you get to see what everything will look like altogether. Here at Clifford Burr Bridal we have a range of accessories to complete your look. Please have a look at our bridal accessory page to get an idea of what is available. If you have not purchased your dress from us then you can still come in and book an accessory appointment with us. Please check out our bridal accessories page for more information. Please don’t panic! Depending on how long it is till your big day there are other options available. There is always the chance that the designer may have your style and size in stock. We can also sell all of our sample gowns off the peg, so if the size is right then this can be the perfect option for you. Please ask one of our sales consultants in store for more information on this. We will do our very best to try and locate you your dream gown however please bear in mind though that the later you leave it the more limited your choice may be. If you decide to go ahead and order a dress with Clifford Burr Bridal we will need you to be measured and sign terms & conditions. This can be done in store with a member of staff. We require a 50% deposit when you place the order for your dress; the final 50% is due on the gowns arrival. If you can no longer attend your appointment or have found a dress elsewhere? Please, please, please call and cancel your appointment. We completely understand that sometimes things pop up and there is always the chance that you may have already found your dress at a previous appointment. We do have waiting lists that run, especially on a Saturday and therefore if you can no longer make it then it gives us the chance to offer that appointment to someone else. How long does it take for my dress to arrive and be delivered? The delivery time varies depending on the manufacturer. Typically, it can take between 16-20 weeks; with some designers being able to offer a rush cut if required. A month after the order has been placed we will be able to provide you with an estimated delivery date. Please give us a call or drop us an email if you would like to know when we should expect your gown. Once your dress has arrived in store we will notify you by phone; at this point a first try on appointment can be booked. We understand that this is a special time for you and your friends/family and therefore we know it’s important for you to bring people with you. Therefore this is completely up to you. We have two independent fitting rooms; our Rose room can fit three people in it comfortably however our Blossom room can easily fit in seven people so if you do have a big entourage then do let us know when you book your appointment. However we would normally advise that you try to limit the number of people that you bring with you to three as from our experience it will be a far more enjoyable experience for you as too many opinions can be unhelpful and confusing. It is your opinion that is the most important so you don’t want to feel confused. Our gowns range from about £800 to £2,500 when ordered in new. However all of our gowns can be purchased off the peg at a reduced price. Please get in touch with us at info@cliffordburr.co.uk for more information about our off the peg option. What size are our sample gowns? Our sample gowns range between a size 8 to 28. Whilst we only have each dress in one size it may be possible for us to order a sample closer to your size from the designer if they have one (this is usually an extra cost of £25 to £30). If a gown is too big then we can clamp it so that you can see what it would look like and if it is too small we will do our best to give you the best feel of what the dress will look like. We have gowns over the majority of our collections available in a size 8-18 and then all of our Callista samples range from a size 18-28. You could find you will need 1 to 2 sizes larger than high street clothing. This is nothing to be alarmed about, wedding dresses are a lot more structured and fitted than your ordinary clothing. We will take your measurements and recommend an appropriate size for you.